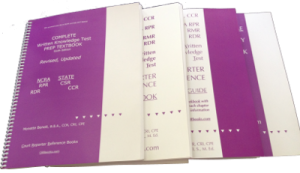 CRR Books has been assisting students, reporters, CART captioners, instructors, schools, and test candidates to advance skills since 1990. * One answer key details quiz questions; ** Second answer key thoroughly details Thesaurus-related words. 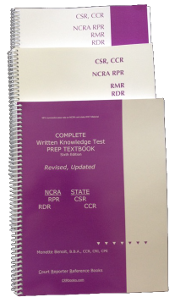 Vocabulary workbook: Excellent prep for NCRA’s RPR, RDR, State CSR exams, and NY Civil Service Exams. Also, the workbook is used for the advanced SAT, ACT, LSAT, ESL, GRE, GMAT, and civil service examinations. Court reporters, students, reporting instructors, law schools, and independent study students use this workbook for their exams, as do educational institutions throughout the world. Expand your reading and speaking vocabulary within well-organized chapters. Did you know each person has a reading vocabulary and a speaking vocabulary and the size of each is different? This workbook clearly defines what you need to know and expands on material to prepare individuals to pass written certifications. Workbook includes: Student’s Instructions; Teacher’s Instructions; Vocabulary Building, Roots, Prefixes, Suffixes, Similar Suffixes, Foreign Words, Phrases, Confusing Words Matching Columns, Similar Word Columns, Eponym Matching Columns, Eponym Word Definitions, Word Division Hyphenation; Word Mechanics, Misspelled Words, Misspelled Compound Words, Misspelled Plural Words, Abbreviations, Pairs of Spelling Errors; Synonyms and Antonyms, Matching Columns, Sentences, Selecting Antonyms, Using Analogy, Unrelated Words; Sentences, Word Comprehension, Recognizing and Correcting Incorrect Sentences; Answer Key #1, Thesaurus Answer Key #2. To order this product click on the “Add to Cart” link. “Having been a captioner for several years and out of reporting and testing arenas, I knew I would need to cram for the Registered Diplomate Reporter exam, RDR. I chose the ’CSR, RPR, RMR, RDR Written Knowledge Test Court Reporter Reference Textbook’ and ’REALTIME Vocabulary Workbook’ to bring myself up to date — and, how out of date I was! Bravo! Behold! A beautiful book by Benoit! Beneficial! Beneficiant! A bellwether and bearer of information! A beacon of enlightment! A bargain! A preview of your RealTime Vocabulary Workbook bring to the forefront the answer of the average reporter’s needs for the immediate future, as ‘REALTIME’ is here to stay and is in universal demand. 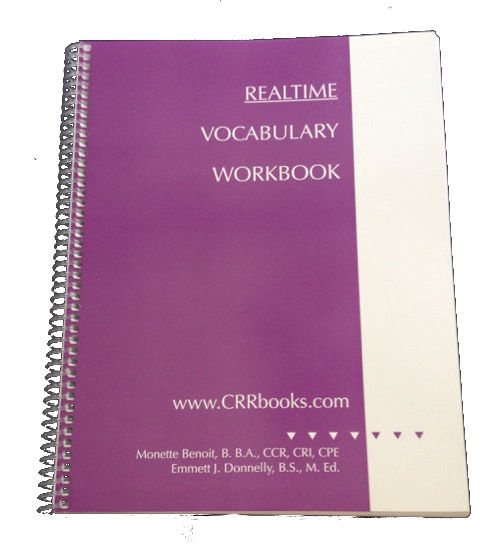 I absolutely recommend this RealTime Vocabulary Workbook.